One reason the GWS Board selected New Orleans as the site of GWS2011 was to give conferees the opportunity to help, in some small way, in the continuing effort to help the city recover after Hurricane Katrina—and to build awareness of environmental concerns and the city's rich history. So, we have put together several Service Projects: organized opportunities during the conference week for you to get out, get your hands dirty, and help in the recovery effort. POSTED FEBRUARY 2, 2011: ALL SERVICE PROJECTS ARE NOW FULL. Why the project is needed: The purpose of this project is to remind residents that everything we put or leave on the ground makes its way to local waterbodies via our stormwater pumping systems. In New Orleans much of our stormwater infrastructure is continually clogged with dirt, debris and litter. This half-day event will allow us to assist in neighborhood flood protection and litter & water quality awareness. What you will be doing: We will spend the afternoon in the Freret Neighborhood or along Bayou St. John in mid-city marking storm drains and sweeping the area around neighborhood catchment basins along flood-prone streets. The Basin Sweep Project will involve storm drain marking and catchment basin sweeps. Volunteers will glue "No Dumping — Drains to the Lake" markers on storm water catchment basins in neighborhoods around New Orleans. In addition to marking drains, we will assist residents with basin sweeps (removing dirt, debris, litter & leaves from the street around these catchment basins) in and around these flood prone neighborhoods. This project will take place in the neighborhoods near either City Park in mid-city New Orleans or on the streetcar line near Audubon Park in "uptown" New Orleans so that breaks can be enjoyed in one of these two settings. We encourage participants to come out and join us as we encourage citizens to "take back their basins." This event is meant to encourage residents to take responsibility for the dirt and debris that both clog our stormwater infrastructure as well as bring pollutant laden sediments to our drainage canals and ultimately to our Estuary. What you need to bring with you: Work gloves; water bottle; snacks. Wear comfortable clothing that you wouldn't mind getting a little dirty. This project will take place rain or shine, so be prepared with rainwear if conditions warrant. What equipment will be provided: All necessary cleanup equipment, brooms, etc. Special skills required: None other than bending and sweeping. Number of people needed: 10-25. Why the project is needed: This service project will be an important contribution to raising flood awareness in New Orleans. The “Rise Above the Flood” campaign is an effort to highlight the role of local businesses and organizations in the recovery of New Orleans following Hurricane Katrina, while raising awareness of the need to mitigate against future flood damage. Volunteers will paint markers on participating buildings indicating the Hurricane Katrina flood level. These “Rise Above the Flood” markers will serve as reminders of the resurgence of local businesses and organizations following Katrina, and will help bring public awareness of the need for flood protection. Goal: Our goal is to channel the awareness of the flood risk from Hurricane Katrina into a culture of mitigation in New Orleans. By building a coalition of “Rise Above the Flood” businesses and community organizations, we will honor the Hurricane Katrina recovery efforts while reminding residents of the need to mitigate against future flood damage. What you will be doing: This service project will call upon volunteers to paint Hurricane Katrina flood markers on participating local businesses and organizations. Properties that wish to participate in this project will be identified prior to the volunteer day. On the day of the service project, volunteers will work in pairs or groups to stencil the Hurricane Katrina markers on buildings. This service project will place flood markers throughout the city, providing residents and visitors with a visual representation of Hurricane Katrina flood levels. What equipment will be provided: Paint/spray paint, paint brushes, measuring tape, ladder, stencils to mark Hurricane Katrina flood levels. Special skills required: None other than ability to use equipment noted above. Number of people needed: 5-15. Note: Lunch is on your own — there will be places to grab lunch near the worksites. 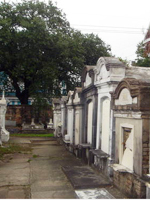 Why the project is needed: There are 37 historic above-ground cemeteries in New Orleans. Most of these cemeteries have no perpetual care provided for the cleaning of the grounds or the general upkeep of the individual or family plot markers. This project could take several weeks to triage the cememteries and then provide the needed time to reclaim their respective historic grandeur to the established status of continued respect for those interred within them. This project will add to the numerous new vistors traveling from all parts of the world to experience these centuries old, and in America, nearly unique resting places. What you will be doing: We will be restoring Lafayette #1 to its status before it fell into disrepair by removing debris, cleaning up fallen leaves and other plant remains, cleaning up trash, repairing Morte Safes, weeding and cleaning walking paths and reflecting pools. What equipment will be provided: Cleaning supplies, bags, brooms, shovels, and plant trimmers. Number of people needed: Approximately 20. Note: Lunch is on your own — there will be places to grab lunch near the worksite. Some background on the history of Lafayette #1: Lafayette Cemetery #1 is one of the oldest cemeteries in the city. If you are a movie buff, parts may seem familiar to you, as this is a favorite scene in many movies made here in New Orleans. 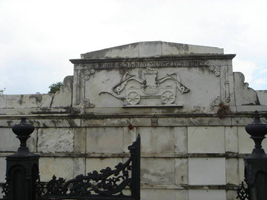 The history of the cemetery goes back to the beginning of the 19th century, before it was part of New Orleans. Built in what was once the City of Lafayette, the cemetery was officially established in 1833. The area was formerly part of the Livaudais plantation, and that square had been used for burials since 1824. The cemetery was laid out by Benjamin Buisson, and consisted of two intersecting roads that divide the property into four quadrants. 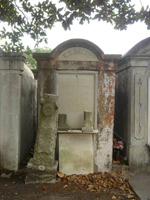 In 1852, New Orleans annexed the City of Lafayette, and the graveyard became the city cemetery, the first planned cemetery in New Orleans. The first available burial records are dated from August 3, 1843, although the cemetery had been in use prior to that date. In 1841, there were 241 burials in Lafayette of victims of yellow fever. In 1847, approximately 3000 people died of yellow fever, and Lafayette holds about 613 of those. By 1853, the worst outbreak ever caused more than 8000 deaths, and bodies were often left at the gates of Lafayette. Many of these victims were immigrants and flatboat men, who worked in the area on the Mississippi. The cemetery fell on hard times, and many of the tombs were vandalized, or fell into ruin. Thanks to the hard work of the organization "Save Our Cemeteries," there have been extensive restoration and preservation efforts, and Lafayette is open for tours. Wall vaults, or "ovens" line the perimeter of the cemetery here, as in St. Roch and the St. Louis properties. Notable tombs here are the Smith & Dumestre family tomb, in Section 2, with 37 names carved on it, with dates ranging from 1861 to 1997. Many tombs list such various causes of death as yellow fever, apoplexy, and being struck by lightning. Also depicted are veterans of various wars, including the Civil War and a member of the French Foreign Legion. Eight tombs list ladies as "consorts." Several distinctive monuments are for the deceased of "Woodman of the World," an insurance company still in existence which offered a "monument benefit." 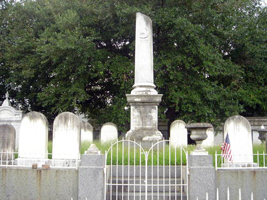 Brigadier General Harry T. Hays of the Confederate Army is buried here, in an area featuring a broken column. The Brunies family, of jazz fame, has a tomb here. The Lafayette Hook and Ladder Co. No. 1, the Chalmette Fire Co. No. 32, and the Jefferson Fire Company No. 22, all have group tombs here. The "Secret Garden" is a square of four tombs built by friends, "the Quarto," who wished to be buried together. According to Save Our Cemeteries, the Quarto held secret meetings, but the last member destroyed their book of notes. The only evidence of their existence are two keys from their minutes, which have been made into broaches and belong to their descendants.